You’re too busy to spend a lot of time worrying about protecting your PC. With Microsoft Security Essentials Beta, you get high-quality protection against viruses and spyware, including Trojans, worms and other malicious software. And best of all, there are no costs or annoying subscriptions to keep track of. It’s very easy to install Security Essentials using it is even easier than one might expect. Updates and upgrades are automatic, so there’s no need to worry about having the latest protection. 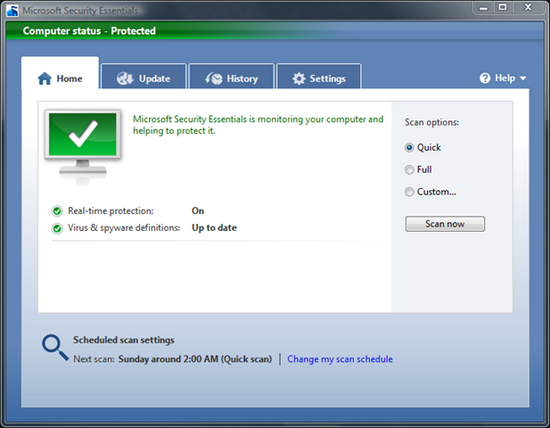 It’s easy to tell if you’re protected – when the Security Essentials icon is green, your status is good. It’s as simple as that.